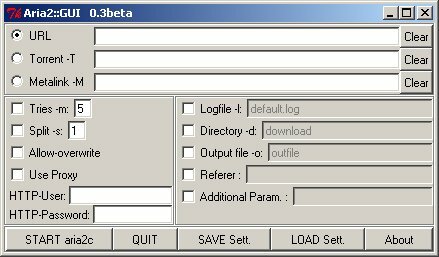 Aria2::GUI is a graphical user Interface (GUI) for the command-line operated aria2. Aria2::gui runs on Linux and Windoze. It handles not every option of aria2, but some of the mainly used options. Read the manual of aria2c to get more information. You can save all active options to a settingfile (*rc). Windoze don't accept the Linux-filename. So I renamed aria2::gui to aria2__gui. Call "aria2::gui.pl" (In Windoze: "aria2__gui.pl"). That's all. Make sure that aria2c is in your current PATH. 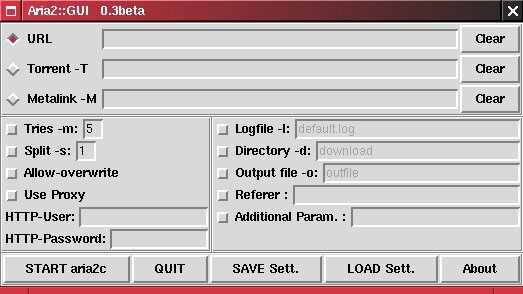 The active options are stored to any settingfile "*rc" by clicking "Save Settings".